Siġġiewi (Maltese: Is-Siġġiewi, [sɪdʒˈʒiːwɪ]), also called by its title Città Ferdinand, is a city and a local council in the Southern Region of Malta. It is the third largest council in Malta by surface area, after Rabat and Mellieħa respectively. 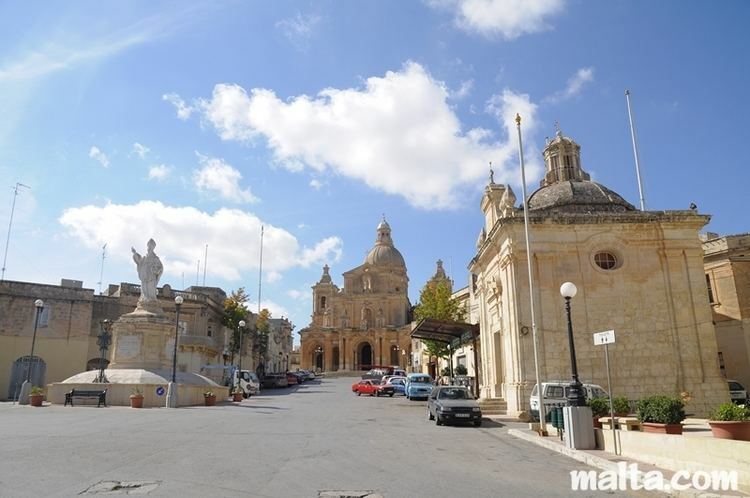 It is situated on a plateau, a few kilometres away from Mdina, the ancient capital city of Malta, and 10 kilometres (6 miles) away from Valletta, the contemporary capital. It is the home of 8367 inhabitants as of March 2014. Until several decades ago, most of the population was employed in the fields which surround the village. In 1993, the city adopted the motto Labore et Virtute (Work and Virtue). The origins of the name Siggiewi are unknown. The name is unique and bears no resemblance to well-known words. "Siggiewi" may be a corruption of an old name. The areas around Siggiewi were inhabited since the Maltese islands were occupied by the first farmers during the Neolithic period. The Neolithic sites of Hagar Qim and Mnajdra (3600-2500 BC) are within walking distance of the village. Also within easy reach of the village are the Bronze Age settlement of Wardija ta’ San Gorg, almost at the southern tail end of Dingli Cliffs, and the Bronze Age cart-ruts at ix-Xaghra ta’ Ghar il-Kbir (1500-750/800 BC). An early Phoenician tomb was located in the area, but small Phoenician/Punic cemeteries are known on the hill top of tal-Gholja and at ix-Xaghra ta’ Ghar il-kbir. In numerous places, Roman pottery scatters are often encountered, suggesting that the environs of Siggiewi were also occupied during the Roman occupation of Malta and Gozo. Several buildings in Siggiewi date back to Hospitaller rule, including the Armoury. On December 30, 1797, after a formal request by Don Salvatore Curso, on behalf of his parishioners, Grand Master Ferdinand Von Hompesch instituted the village as a city calling it after his name, "Città Ferdinand". The ruins of the former parish church, dedicated to St Nicholas of Bari are still visible today. Lately, great restoration works have been carried out and retrieved its old glory. The baroque parish church, dedicated to the same saint, was erected by the villagers who raised the necessary funds between the years 1676 to 1693. It was designed by the Maltese architect, Lorenzo Gafà but underwent some changes throughout the years. The portico and naves were added by Professor Nicola Żammit in the latter half of the 19th century. From Siġġiewi, you can look upon the Inquisitor's summer palace, built by inquisitor Onorato Visconti in 1625 and renovated by inquisitor Angelo Dorini in 1763. Today it is the Maltese Prime Minister's official residence. The palace of Grand Master Verdalle is one of the residences of the Presidents of the Republic, called Verdala Palace. Adjoining this palace one finds the famous Buskett, a small semi-wild woodland which Grand Masters such as De Valette used as hunting grounds. The Limestone Heritage Park & Gardens is also one of the attractions situated is a renovated quarry, offering an informative tour about Malta's history set in stone. Maltese summer folklore evening also take place between May and October. Malta Falconry Centre lies just outside the city. Every village in Malta celebrates the local church's patron saint with a major festa lasting a week or nine days. When the main Saint Nicholas festa in Siggiewi is held the last Sunday in June, the Church of Saint Nicholas is beautifully decorated and lit, inside and out. The whole village, houses and all, are festooned with garlands, banners and flags. Festival week is also a time for visiting and hospitality as people come from all over Malta to enjoy the celebration. Brass bands march and play in competition throughout the week. The oldest Siggiewi band, St. Nicholas Band Club, located on St. Nicholas Square, and the Siggiewi Festival Brass Band and Social Club, organized in the 1990s, both make the Siggiewi St. Nicholas feast one of Malta's most enjoyable. As with most festivals, food is important. Kiosks sell ice cream, hot dogs, burgers, kebobs, chips and more. Special sweets include mgaret, pastry stuffed with dates, and white nougat with almonds or peanuts. The week features many processions—one night features relics, another, St. Nicholas statue—and religious services. Solemn Mass with Gregorian chant, Solemn Te Deum, Solemn Novena with Hymns to St. Nicholas, and Solemn Benediction of the Blessed Sacrament, are all part of the week-long celebration. The long homily features rhyming words and may be evaluated by how many Latin quotations or how many times St. Nicholas' name is used. Saturday night Siggiewi Festa On Saturday night before the Sunday Feast Day a major procession with brass bands goes through the village. A spectacular fireworks display ends the evening. On Sunday the large St. Nicholas statue comes out of the church go in procession through the village. This lively procession has rich music, incense, confetti thrown by bystanders, and palm branches and flowers. On returning to the church the statue is welcomed with clapping, crying and singing. Inside the church the adoration of the Blessed Sacrament follows. It is a truly beautiful climax to the week of festivity. There is competition among Malta villages to have the most spectacular feast. So each town strives to have the most extravagant fireworks and the most accomplished musicians. Festival organizers collect significant funds so they can add to their accumulation of statues, flags and banners. These rivalries go back a long time—when the churches were built, parishioners gave generously to build the most beautiful and rich churches they could afford. Churches are prominently placed and can often be seen for miles. Though the main festival, like most traditional festivals in Malta is in June, there is also a festival Mass for St. Nicholas on his feast day on 6 December. The Saint Nicholas Band Club decorates the main piazza balconies with six large banners. After the Mass they play a concert in front of the church. Siġġiewi is the location of two band clubs, the Banda San Nikola A.D.1883 and the Siggiewi Festival Brass Band, founded in 1986. The Siggiewi Festival Brass Band was the first band established in Malta which plays only instruments made of brass. It is also the home of a scout group, Siggiewi Football Club, Siggiewi Basketball Club and St Nicholas Suns Basketball Club. The St Nicholas Fireworks Factory is based in the town. Carmel Vella, SIGGIEWI (Città Ferdinand)- A Profile of History, Social Life and Traditions. Pawlu Aquilina, Hawn Twieldet u tibqa' thabbat Qalbi. (My heart was born here and will beat here forever). Memoirs/social history of the last 70 years.